Fifth century Britannia is in shock at the murder of charismatic High King, Ambrosius Aurelianus, and looks to his brother and successor, Uther, to continue his work in leading the resistance to barbarian invaders. 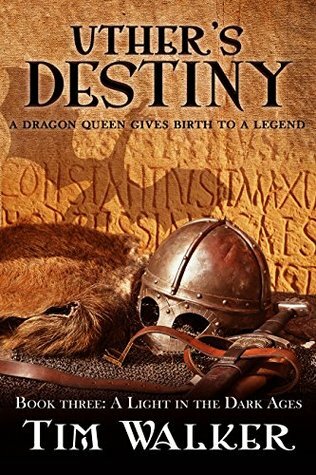 Uther’s destiny as a warrior king seems set until his world is turned on its head when his burning desire to possess the beautiful Ygerne leads to conflict. Could the fate of his kingdom hang in the balance as a consequence? Now this is book 3 in the series and it worked perfectly well as a stand alone for me. Set in fifth century Britannia, one of the things that Tim Walker makes a point of telling the reader, is that there are very little actual records of this time. It is all a little sketchy. Well all I can say to that is he has made a darn good job of filling the gaps because this is one pretty intense read. I think it is a shame that stories and events from the past are all under the heading of ‘History’, it is a treasure trove of events and very colourful characters. From who shall be King of Britannia, to love stories, to ferrous battles and human sacrifices. All pretty cool. Now envy of living back in this era I haven’t though, especially as a woman! Although it may have been normal practice for how King Uther behaved, I don’t know, but I just did not like him. I mean talk about I came, I saw, and I conquered. The hairs on my arms are coming up just writing about him. His obsession for the wife of one of his men is all-consuming for him. He is King and will take what ever he wants without losing face. It leads him, through the guidance of Merlyn and his visions, on the road to produce a legend King of the future. Just heart breaking at times for poor Ygerne. This is just one totally absorbing read with tell it as it is writing of some of the cruelest and bloodiest battles to take back land from invaders. Merlyn had his own agenda and the ear of a willing King. Set over quite a number of years, this book is a complete story in itself. I really enjoyed the pace of it all, no lulls, just a seamless mix of fact and fiction to create a cracking story. I am an indie author based in Windsor in UK. Postcards from London, a book of short stories, is my latest release in September 2017. In March 2018 I will launch my third historical novel, Uther’s Destiny. My other release from 2017 is an historical fiction novel, Ambrosius: Last of the Romans, set in the fifth century after the Romans left Britain. This book is part two in A Light in the Dark Ages series. My first novel, Devil Gate Dawn, released in April 2016, is a thriller set in 2026 that predicts political chaos in a divided post-Brexit UK, and a dystopian Trump America. I also have a book of short stories, Thames Valley Tales, a collection of 15 contemporary stories that evoke the rich history and legend of places along the River Thames. Abandoned! is a short novella, and is part one of A Light in the Dark Ages series. I am currently writing part three, working title, Uther’s Destiny. I have recently published my first children’s book, The Adventures of Charly Holmes, co-authored with my daughter, Cathy.